Reliance Precision of Huddersfield are delighted to welcome six new apprentices to their Engineering Apprenticeship Scheme – Lewis Williamson, Adam Petherick, Joe Newsholme, Zak Bell, Shanesia McKean and Catherine Smith. This year’s students, ranging from 16 – 20 years of age, will now embark on a four year programme to develop their mechanical engineering skills to the highest of standards. From an initial application of almost 50 candidates, the applicants progressed through various stages of the rigorous recruitment process. The first stage entailed various tests and interviews, with the successful candidates progressing through to Reliance’s famous ‘spaghetti bridge’ team challenge. The process then culminated in an interview with Reliance’s Head of Operations, Ken Jolley, Head of Compliance, Jon Plascott, and Managing Director, Andrew Wright. Reliance’s Apprentice Training Co-ordinator, Robert Farrell, explains “We had a very high standard of applicants this year. The successful candidates displayed a genuine interest in mechanical engineering throughout the whole application process, and each demonstrated their abilities effectively, particularly in the spaghetti bridge challenge. All are keen and eager, with a desire to learn, and show real signs of ambition for the future.” He adds “This year’s intake are drawn from a slightly wider geographical area than previously, an indication perhaps of the work we have been doing to develop relationships with schools in the region”. 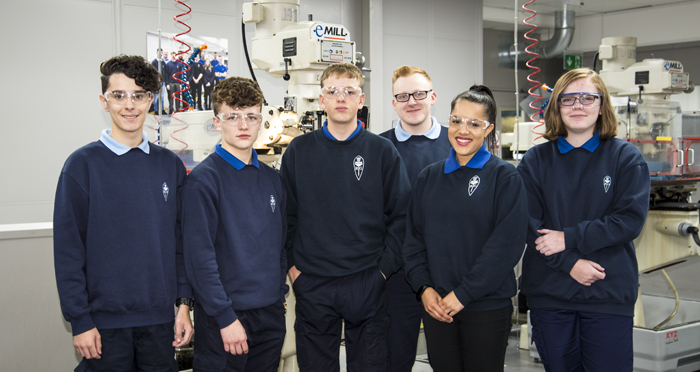 The apprentices will spend their first year in the newly refurbished Apprentice Training Area, where they will work alongside the highly experienced Tool Room team to learn their core engineering skills, as well as attending Kirklees College Engineering Centre in Huddersfield, on day release. Robert has recently taken over responsibility for the recruitment and training of Reliance’s apprentices from Richard Walley. Richard, who has recruited, trained and mentored Reliance’s apprentices over the last six years, has moved into the new role of Assembly Production Engineer, where he’ll be supporting the assembly team, looking at improving processes and efficiencies. Robert was seen as the natural successor to Richard having been involved in the Engineering Apprenticeship Scheme in various training and assessment supporting roles since 2006.